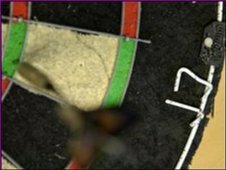 A darts fan has been found dead under ice in a lake at the venue where the world championships are being held. Philip Hughes, 45, from Slough was found by a member of staff at the Lakeside Complex, in Frimley Green. The man had been staying at the hotel to watch the international competition which is due to finish on Sunday. Robert Holmes, from the British Darts Organisation (BDO), said: "A body was taken from the lake and it was someone who had been here to watch the darts." He added: "The weather has played a major part in this. "In 25 years I have never seen weather like it. "On behalf of the BDO we send our condolences on this. It's a tragedy." The large lake at the centre of the complex is frozen and has now been fenced off. Surrey police have begun an investigation into the cause of death.